The BJP’s announcement of political greenhorn Raju Bista as its candidate for the Darjeeling Lok Sabha constituency in West Bengal has led to fissures in the Bimal Gurung faction of the Gorkha Janmukti Morcha (GJM). On Monday, senior GJM leader Swaraj Thapa resigned from the party in protest, saying the BJP was “foisting a candidate for the Darjeeling Lok Sabha seat who is a rank outsider”. He has now filed his nomination as an Independent. Bista’s nomination came as a surprise to many. But BJP national general secretary Kailash Vijayvargiya says it is Bista’s “extensive background in social work” that prompted the party to choose him. “I don’t know if he is a Gorkha, par woh Pahari hai (but he belongs to the hills). He was born in Manipur so there is a Northeast connection there. He is the MD of a very big company, Surya Roshni Limited, that has a strong CSR wing and runs a big NGO (Surya Foundation) in which he mans 1,500 volunteers, so he has organisational skills,” the BJP leader said. What perhaps also helps is that Bista, who lives in Delhi, is considered close to the RSS and in particular to BJP national general secretary Ram Lal. Headed by industrialist J P Agarwal, Surya Roshni Limited began with a steel plant in Bahadurgarh in 1973, later diversifying into steel pipe manufacturing, oil, gas and agriculture. According to industry insiders, the company, that has an annual turnover of Rs 5,000 crore, did exceptionally well in the last two years following the slump in steel pipe production in China. Bista is considered J P Agarwal’s adopted son. The GNLF had earlier objected to the Darjeeling ticket being given to Ahluwalia, saying the public sentiment against the Darjeeling MP was strong. The GNLF decided to support the BJP only after the CPM-Congress alliance, as part of which the GNLF would have fielded a Darjeeling candidate, crumbled in Bengal. The breaking down of the alliance means a number of other smaller Gorkha parties will also be fielding own candidates now. The Communist Party of Revolutionary Marxists is fielding former Lok Sabha MP R B Rai, while the CPM’s candidate Saman Pathak is another well-known Gorka leader. The vice-president of the rival Binoy Tamang-Anit Thapa faction of the GJM, Anit Thapa, claimed the BJP choice of candidate would work in favour of the TMC. The Tamang faction recently fielded Darjeeling MLA Amar Rai as its candidate from Darjeeling. With the election symbol of the GJM demanded by both factions, Rai will be contesting on a TMC ticket. “Having supported the BJP for the past decade, people have no reason to vote for it… We believe the BJP has been misguided by the Gurung gang and GNLF,” Anit Thapa said. 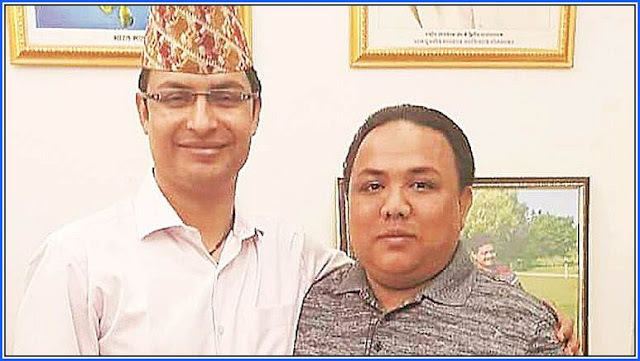 The BJP’s announcement of political greenhorn Raju Bista as its candidate for the Darjeeling Lok Sabha constituency in West Bengal has led to fissures in the Bimal Gurung faction of the Gorkha Janmukti Morcha (GJM).